WASHINGTON? The blue-ribbon panel asked by the White House in May to come up with a set ofoptions for NASA?s human spaceflight future is expected to brief senioradministration officials Friday on as many as eight such scenarios, accordingto retired Lockheed Martin Chief Executive Norman Augustine, the man leadingthe 10-member committee. ?My guessis there will be between six andeight options,? he told Space News, SPACE.com?s sister publication,in an interview Tuesday. ?We?re still mulling. There are some other optionswe?d like to add, but to give the president 15 options would be to do adisservice.? TheAugustine panel has spent the past two months reviewing alternatives to theU.S. space agency?s Moon-focused Constellation program, which includes theOrion Crew Exploration Vehicle and the Ares I rocket designed to launch it intolow-Earth orbit. Last week the panel debated the merits of a list of sevenoptions that ranged from the conservative ? including a plan to stretch outConstellation beyond its planned operational capability of March 2015 ? to morecostly scenarios that would have NASA bypass the Moon and send humansto Mars. The panelmeets today to finalize its options before Augustine presents them to NASAAdministrator Charlie Bolden and White House science adviser John Holdrenon Friday. Augustinemade clear that he will be presenting options, not recommendations. ?We wereasked to provide options and I would undermine the president?s ability to makea sound recommendation if I were to voice my opinion,? he said. ?But one of themajor facts being weighed is what we can afford. I just don?t have the abilityto judge that. I?d love to see us have a very aggressive human spaceflightprogram that would not damage the robotic program, I should emphasize, but Ijust don?t know what we?re going to be spending on healthcare and the two warsand how that will evolve. Only the president and the Congress are in a positionto do that.? 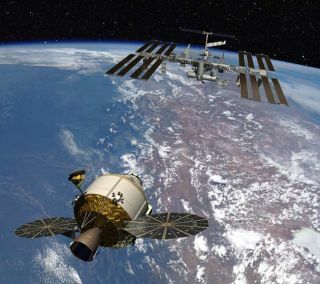 Among thepanel?s seven or eight options, two are expected to fit within NASA?s plannedfunding 10-year profile, which includes about $80 billion for mannedspaceflight programs. In addition, Augustine said, the panel will provide morethan one option ?with a commercialcrew characterization? for getting humans to low-Earth orbit. ?I?vedeveloped a great deal more confidence in commercial spaceflight than I wouldhave had at the beginning,? he said. ?I?ve always believed there was a greatcommercial role in the unmanned arena, but the more I?ve thought about it, themore I think that applies to the human arena as well.? Augustinealso said he has not seen any showstoppers that would prevent NASA from fieldingAres and Orion. ?Allaggressive technical programs have problems. I?ve never worked on one thatdidn?t,? he said. ?For example, Ares I has some problems. Some of thoseproblems have not yet been solved. Most are of an engineering nature, asopposed to requiring new science.? He said whilesome of these issues could prove difficult to resolve, they are not unlikechallenges NASA faced in developing the Apollolunar program that in 1969 sent humans to the surface of the Moon for thefirst time. ?I lookback at the problem Apollo faced at this point in time, and the problems thatApollo faced in my mind were much more serious than what one sees with theexisting program,? he said. ?But the fact is that this is a new era, with a newrisk-taking mentality, so I?m not sure that?s relevant. But it?s interesting. ?